Age of volunteers: We love kids of all ages! However, you MUST BE AT LEAST 13 TO VOLUNTEER. Please feel free to contact Colleen Watt ([email protected]) with any questions. Clothes: Wear comfortable shoes and clothes. Layers recommended for the winter. Groups: If you are coordinating a group and don't see a time that works, please let us know and we will make accommodations. WINTER ALERT: We will send out an email to those who have signed up if we need to cancel. In addition, we will update our answering machine message. Safety first. Thank you for any time you can offer! We couldn't do this without you. 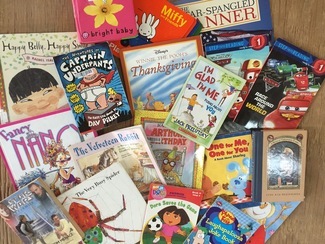 PS Yes, we'd love to have any gently-used children's books you or your friends have to donate. Please consider letting folks know you are coming so you can bring their kids' books too! I am bringing two other students with me. (Their names are... Josh and Meredith. My daughter Logan Williams will be attending along with her friend's Nia Wells and Tashara Deaver.